Between 1834 and 1844 Berlioz stayed at 3 different addresses in rue de Londres in the IXth arrondissement, all of them in close proximity: no. 34 from October 1834 to May 1835, no. 35 from September 1836 to October 1837, then no. 31 from October 1837 to some time in 1844. 34 rue de Londres. The first stay, at no. 34, was only an interlude in the period of residence of Berlioz and Harriet Smithson at Montmartre between 1834 and 1836. The drawbacks of the winter season in Montmartre (CG nos. 457, 458) probably persuaded the couple to move back to Paris till the spring. The forthcoming move to 34 rue de Londres is mentioned in a letter dated 23 September 1834; as Berlioz says there, the flat was unfurnished and thus cheaper to rent, but it involved extra expenditure for furnishing (CG no. 409). The new address is first attested in a letter of 6 October 1834 (CG no. 410, with a postmark of 7 October); it is last mentioned in a letter dated 28 April 1835 (CG no. 433). The residence at 34 rue de Londres was meant to be temporary: the impending move back to Montmartre is mentioned in a letter of 6 May 1835 (CG no. 435). 35 rue de Londres. The second time round, Berlioz and Harriet Smithson did decide to endure the rigours of winter 1835-6 in Montmartre (CG no. 445), but it became clear to them that it was not practical for them to stay there permanently, and even before the end of the winter they were already thinking of moving back to Paris (CG no. 454). The move to the new address, 35 rue de Londres, took place in the latter part of September 1836, though in practice there was an overlap of several weeks between the old Montmartre and the new Paris addresses: a letter of 15 September is written from Montmartre, and Berlioz says he will be there till October 5 (CG no. 477), while the next preserved letter, dated 27 September, carries the new address, which is underlined to draw attention to it (CG no. 478). But a letter dated 11 November still has the Montmartre address, and Berlioz states in it that 35 rue de Londres will he his address ‘from next Saturday’, i.e. presumably 19 November (CG no. 482). The last attestation of this particular rue de Londres address is in a letter dated 17 September 1837 (CG no. 509, with a postmark of 18 September). Berlioz and Harriet Smithson thus stayed at this address for just over a year. It was at 35 rue de Londres that Berlioz completed his opera Benvenuto Cellini (CG no. 493) and wrote the Requiem in 1837 (e.g. CG nos. 493, 496, 502, 504, 506). 31 rue de Londres. It is not known what prompted the move from 35 to 31 rue de Londres (unless all that was involved was a renumbering of the same building; be that as it may, the address 35 rue de Londres disappears from the composer’s correspondence after this time). The new address is first attested in a letter dated 11 October 1837 (CG no. 510bis, in vol. VIII), then in a letter of 12 October, where the address is underlined to draw attention to it (CG no. 511). The last dated mention of the address is in a letter dated 26 July 1844 (CG no. 915). 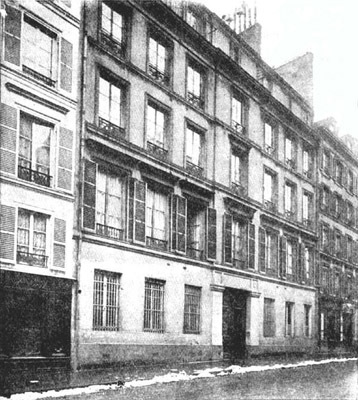 The stay at 31 rue de Londres was thus Berlioz’s longest period of continuous residence at the same address since he first arrived in Paris in 1821. It was there that a number of major works were written, notably the overture to Benvenuto Cellini, the choral symphony Roméo et Juliette, the Symphonie funèbre et triomphale, the song-cycle Les Nuits d’été, the Rêverie et caprice for violin and orchestra, the recitatives for Weber’s Der Freyschütz and the orchestration of the Invitation to the Dance, the ballad la Mort d’Ophélie, and the overture Roman Carnival. The stay at 31 rue de Londres could have continued beyond 1844; but developments in Berlioz’s private life eventually brought it to an end. At some time in the early 1840s, before his first trip to Germany in 1842-1843, Berlioz became involved with the singer Marie Recio, and he travelled with her to Brussels in September 1842, then at the end of the year to Germany (Memoirs, chapter 51). At some point in 1844, and possibly earlier, he started to live with her at her flat at 41 rue de Provence, while Harriet Smithson on her side went to reside at 43 rue Blanche, not later than November 1844. It is not clear when exactly in the summer or autumn of 1844 the flat at 31 rue de Londres was finally vacated. 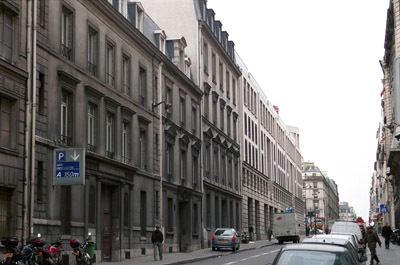 Note: a letter of 9 December 1837 is addressed to Berlioz at ‘15 rue de Londres’ (CG no. 526); another letter of 8 March 1838 is addressed to him at ‘96 rue de Londres’ (CG no. 543). Both addresses are likely to be mistakes. Of the three addresses in rue de Londres, only the site of no. 34 is extant (on the right hand side of the road on the first photo below), but the present building has been extensively repaired and modified and probably bears the mark of different periods. The earliest parts (notably the staircase from the 2nd floor upwards) may go back to Berlioz’s time, but much of the façade, the entrance to the building, and the staircase up to the 2nd floor date from the mid-20th C. We are grateful to M. Ludart, a visitor to our site, for supplying these details to us after a careful examination of the inside and outside of the building. On the other hand nos. 31 and 35 have completely disappeared, and their place has been taken by a large modern building presently occupied by the administration of the SNCF (the French national railway). On the first photo below, the last residential building on the left side of the street is no. 21, after which the white SNCF building has the numbers 23 and 29. The modern photograph reproduced on this page was taken by Michel Austin in 2000; the old photo is in our own collection. © Monir Tayeb and Michel Austin. All rights of reproduction reserved. The above photo is taken from The International Library of Music for Home and Studio. Music Literature volume 1, p.168 (New York, 1925), a copy of which is in our own collection; it purports to show the building at no. 31 rue de Londres in which Berlioz lived, though the dates given for Berlioz’s residence there (1843-1846) are incorrect.